EVERETT, Wash. – Jake Christiansen scored two goals, including one to send the game into overtime on an extra attacker situation, but Andrej Kukuca scored the winner with 3:58 left to lift the Seattle Thunderbirds past the Everett Silvertips, 5-4 in overtime on Saturday at the Delta Hotels Preseason Classic at Angel of the Winds Arena. The Tips, dropping their first two preseason games in a shootout or overtime, were 2-of-8 on the power play and have five power play goals in their first two preseason games. Bryce Kindopp and Connor Dewar each had two assists, while Sean Richards had a goal and an assist. 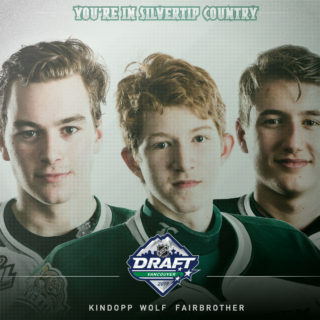 Richards scored the game’s first goal 70 seconds into the first period off assists from Reece Vitelli and Bryce Kindopp, burying a wrister from the left circle. Only two minutes into the second period, Seattle defenseman Simon Kubicek netted his first goal of the night to tie the game. Luke Ormsby answered less than six minutes later with a goal to regain the lead for the Silvertips on a rebound. Before Jake Christiansen’s power play goal at 14:27, tensions rose as both teams logged a combined seven penalties in less than four minutes. Seattle scored three unanswered goals to climb out of a 3-1 hole in the third period. Nolan Volcan tapped in his first of the preseason at 7:15 and Graeme Bryks buried a snap shot between the circles to tie the game on a power play at 9:46. Mike MacLean’s rebound at the net gave Seattle a 4-3 edge at 10:36, also the back end of two straight power play goals. Christiansen’s second goal with less than two minutes remaining in regulation led the game into overtime when he buried a drive from the top of the left circle. Seattle’s Andrej Kukuca found the net at 3:58 into OT, assisted by Owen Williams, to log the Thunderbird’s first win of the tournament. 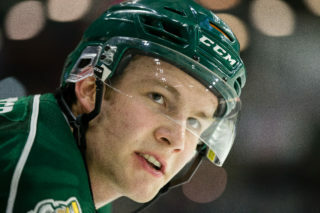 NOTES: The Tips scratched Conrad Mitchell, Ian Walker, Alex Moar, Dylan Anderson, Gianni Fairbrother, Wyatte Wylie, Olen Zellweger, and goaltender Dustin Wolf … the Tips scored the first goal of the game for the second night in a row … Christiansen led the Tips with nine shots on goal in the game. The Silvertips conclude the Delta Hotels Preseason Classic tomorrow, 7pm against Portland. 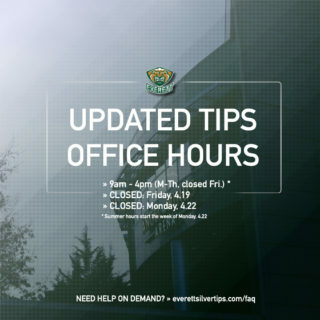 Tickets for the Delta Hotels Preseason Classic are on sale online, by phone, or in person at the Silvertips offices. 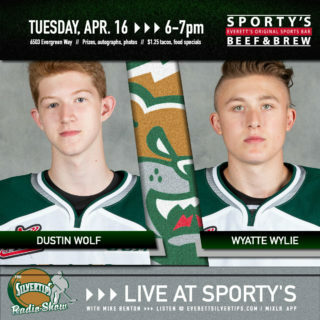 All preseason tickets – offering general admission seating for Tips home games – are available athttp://everettsilvertips.com/preseason. 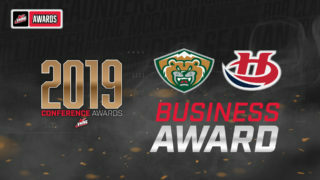 All tourney games will offer play-by-play streaming coverage at www.everettsilvertips.com.